1. SCRUB POTATOES WELL; REMOVE ANY BLEMISHES. PLACE ON SHEET PANS. PRICK SKIN WITH FORK TO ALLOW STEAM TO ESCAPE. 2. BAKE 50 MINUTES OR UNTIL DONE. TOP OF POTATOES MAY BE SLIT LENGTHWISE AND CROSSWISE AFTER BAKING AND OPENED SLIGHTLY. IF DESIRED, PLACE 1 PAT BUTTER OR MARGARINE IN EACH POTATO; SPRINKLE 1 OZ (1/2 CUP) MINCED, FRESH PARSLEY OR 1 OZ (1/4 CUP) GROUND PAPRIKA OVER POTATOES. IN STEP 1, CUT POTATOES MAY BE DIPPED IN SOLUTION OF ANTIOXIDANT AND WATER TO PREVENT DISCOLORATION. IN STEP 2, IF CONVECTION OVEN IS USED, BAKE AT 400 F. 35 TO 40 MINUTES OR UNTIL DONE ON HIGH FAN; CLOSED VENT. NOTE: 4. POTATOES MAY BE BAKED IN A MICROWAVE OVEN AS NEEDED. 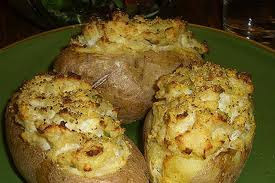 The convection oven recipe of baked potatoes is ready to serve..enjoy it ! Nice !